The latest report from Good Technology on mobility in the enterprise shows that iOS is clearly the dominant platform – in terms of device activations and even more so in terms of mobile apps usage and development. Good’s client base includes major government agencies and 50 of the Fortune 100. 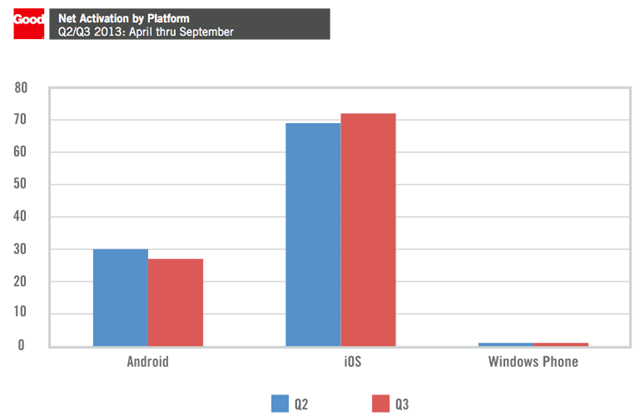 Despite a slight decline in total number of device activations, tablets are more popular for mobile app usage with 81 percent of apps activated this quarter on this form factor. … Document editing comes out on top as the largest single commercial app category securing 56 percent of the activations. …File access and syncing are a strong second with almost 20 percent of all activations. Those sure sound like ‘work’ categories to me. I’m going to go ahead and guess that when Fortune 100 companies invest in custom app development, it’s not for games and entertainment and ‘Play’ apps. So yeah, those Surface TV ads – millions of dollars running those to make a point that’s just so obviously wrong. Nice work Microsoft. I think the point with Microsoft is that you can work on your Office Apps without any special customization apps needed. I give credit to Apple for making inroads in the workplace, but we still use the Surface for Office and SharePoint productivity. Customers have been giving us hard time on the office for iPads. this will give them an opportunity to answer their needs.